Been wanting to make this one all week! You really need a high speed blender to make this one. Otherwise you’re not going to be able to make the sauce smooth enough. I already tried with my Magimix and it was way too lumpy (something I also found with the Hot Chocolate). Magimix’s aren’t made for pureeing nuts! Fortunately Freya’s mum had a Vitamix I could borrow – so I went and did that. To my delight she also had a birthday present for me. A voucher to eat at ‘Terre a Terre‘ in Brighton. Allegedly the best vegetarian restaurant in the UK. Freya has been wanting to eat there for quite some time – so I wonder where that idea came from ! You’ll also need a Spiraliser. Essentially a spiraliser makes spirals out of vegetables. I’ve got a cheap one that I bought from Amazon – which was apparently essential for making anything from the cookery book ‘Raw’ – which I have yet to make anything from. 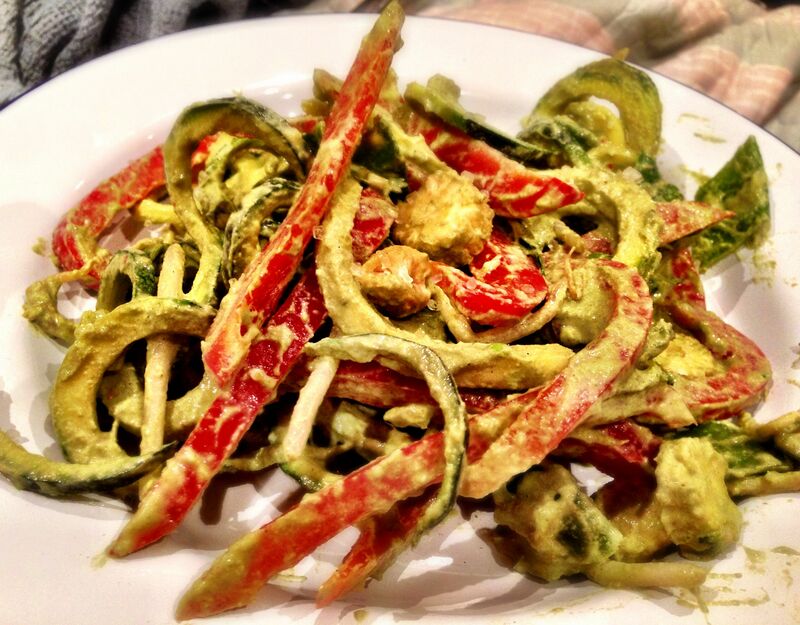 I supposed you could julienne the courgettes but then they wouldn’t look like noodles. Obviously it would still taste the same! Anyway – back to the recipe. You blitz cashews, coriander, fresh curry leaves, garlic, red chilli, lime juice, ginger and coconut milk (and some other herbs and spices) until you get a smooth paste. It goes a lovely avocado green colour. You add this paste to your spiralised courgettes, beansprouts, mange tout, sugar snap peas, baby sweetcorn and sliced red peppers, mix it all together and serve it with a few cashews on top for decoration. This dish is incredibly tasty. And crunchy. And fresh. And very very mild. Barely a curry at all. You’d be convinced there were avocados in there too – but I think that’s just the mind tricking you because of the colour of the sauce. I think if I were making this again I’d want to make it more spicy. This is certainly the mildest curry I’ve every eaten. Maybe more ginger or more red chilli would have done the trick. It did feel like something was lacking. I just don’t know what it was. I loved it though. I’ve just been spoiled by the Honestly Healthy for Life book this week – from which this recipe is taken. This entry was posted in Honestly Healthy for Life, Natasha Corrett & Vicki Edgson, raw, Vegan, Vegetarian, Want to make again, Would put my on spin on it and tagged food, raw, recipe, vegan, vegetarian by tenuoustoaster. Bookmark the permalink.